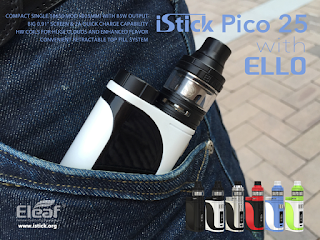 Both Eleaf iStick Pico 25 box mod and ELLO Atomizer are new products by Eleaf, about there features, you can visit http://www.istick.org/istick-pico-25-with-ello-starter-kit-85w-top-filling-2ml-upgradeable-firmware-kit.html, I don't list it again, in a word, they are worth having. If you want to purchase them, I suggest you don't purchase the kit directly. I suggest you purchase the separate mod and the atomzier. there are two resons for you. First, by the price. the price of the kit is $42.9, but the price for mod is $19.9 and the atomizer is $18.9, just only need $38.8, it is cheaper than kit. Second, by the device in the package. The kit miss one part that is HW3 head, so I suggest you purchase them separately.